Click here to see Paper Tigers Spirit Project. FIRST COME THE ZEBRA is one of 7 books to be given to needy schools and libraries world wide. "First Come the Zebra, a picture book that will take people of all ages on a journey they will never forget." 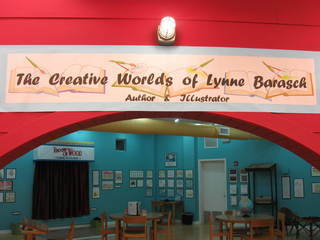 "The Creative Worlds Of Lynne Barasch"
All brought to life via hands on activities. Play Mancala! Send Morse Code! Sit at an old school desk and try out the old blackboard! and more.. Awards for First Come the Zebra! Click here to see TV review of Hiromi's Hands WTNH Good Morning CT! Click here to view the Rutgers Project on Economics and Children review of "Hiromi's Hands," named their March 2009 Book of the Month! Awards for Ask Albert Einstein! Awards for Knockin' on Wood! For as long as I can remember, drawing is what I did best. I hoped that art school would help me eventually find a way to use this. On the other hand, writing is something I never planned to do. Although I was an enthusiastic and indiscriminate reader from the time I was very young I never thought of writing as an occupation until my five year old daughter had an adventure. On her second day of kindergarten she got on the wrong bus and went to the wrong school. After she was safe and sound again at home, I thought this would make a great story. And so, THE BUS FUSS was born. It was never published, but I was hooked. Over the next several years many books followed. My ideas flooded in and came from people I knew. Everything I saw seemed to suggest another story. Here are a few examples. RADIO RESCUE is the story of my father's ham radio days in the 1920s in New York City. My endless interviews with him gave me a window into his life that otherwise would not have been open. HIROMI'S HANDS is the story of my daughter's childhood Japanese American friend. Her father trained her to be a Sushi chef. I met Hiromi as an adorable, shy five year old child and came to know her well over the next eighteen years. KNOCKIN' ON WOOD is the story of Peg Leg Bates, the one legged tap dancer. I first saw him on television on the Ed Sullivan show and wrote his story many years later after hearing my daughter's tap teacher talk about the great tappers he knew. A COUNTRY SCHOOLHOUSE tells the story of my husband's school days in a three room schoolhouse in Dutchess county New York in the 1940s. I had listened to his amusing anecdotes about this for years and finally wrote them down. Not all my stories are nonfiction. OLD FRIENDS is the story of an old lady who recognises her childhood friend in the form of a dog. Sometime after writing this story, much to my surprise, I realized that the old lady was a perfect description of my own grandmother! Telling stories and making pictures gives me great joy. When words and pictures work well together they form something new, something greater than the sum of its parts. I look forward to bringing many more stories to life in this way. Lynne Barasch was born in New York City and grew up in Woodmere, Long Island. She attended Rhode Island School of Design and holds a B.F.A. from Parsons School of Design. She lives in New York City.